Thanks to the guys over Chipworks and their detailed inspection of the board of the iPhone 5s, we now know the full specifications of the chipset of Apple's latest flagship. 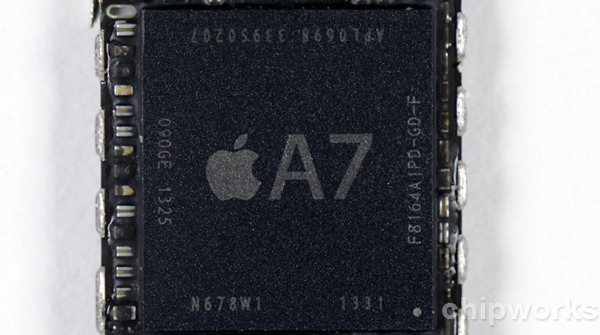 As you probably know since day one, the new iPhone 5s runs on a new Apple A7 SoC that utilizes a 64-bit processor. This new CPU turns out to be a dual-core unit clocked at 1.3GHz and uses the latest ARM v8 64-bit cores. Apple's new cores are called Cyclone and the whole SoC is manufactured by Samsung on its 28nm High-K Metal Gate (HKMG) process. The GPU in charge is the quad-core PowerVR (Series 6) G6430, which supports OpenGL 3.0, DirectX 10 and OpenCL 1.x. It's currently among the best of the market and eats benchmarks for breakfast. Apple kept the RAM amount the same - 1GB, though the RAM used in the iPhone 5s is of the newer LPDDR3 variety, compared to the LPDDR2 embedded in the iPhone 5 and 5c. Finally, the modem chips are made by Qualcomm. If you want to know more about their model numbers and other embedded controllers just head over to the source link below. So, as expected, Apple is currently using the latest pieces of available technology for its flagship. There are no other smartphones that utilize the new ARM v8 cores (Cortex A53 and Cortex A57 are yet to come) yet and the new Series 6 of Imagination's PowerVR GPU's is making its official debut, too. Dude, have you ever read the names?? Its my problem whether i want to post it or not. Oh, so a future device will be more powerful than what is currently on the market? Wow, only a genius could have figured that out. Stay in school. These paid reviewers from Samsung are pathetic.